In most applications on a Mac, displaying images and video is color managed in OS X by a technology called ColorSync. This is also the case for LiveGrade’s Image View that can display movies, stills and live video. Color management in this case means, that the pixel values encoded in a movie file or live video are transformed for display in a way, so that the resulting image on a specific computer monitor leads to the same perception as viewing the same image on a reference broadcast monitor. Due to the assumed different viewing environments of broadcast monitors and computer monitors (dimly lit for broadcast video and brighter viewing conditions for computer monitors), the video displayed on a computer monitor will intentionally not be exactly the same as the original signal displayed on a broadcast monitor (it will basically have a less contrasty gamma of 2.2 instead of a more contrasty video gamma of around 2.4-2.5), but it will achieve the same perception when taking into account the different viewing conditions. For more information on this topic, please see Apple’s TN2257. 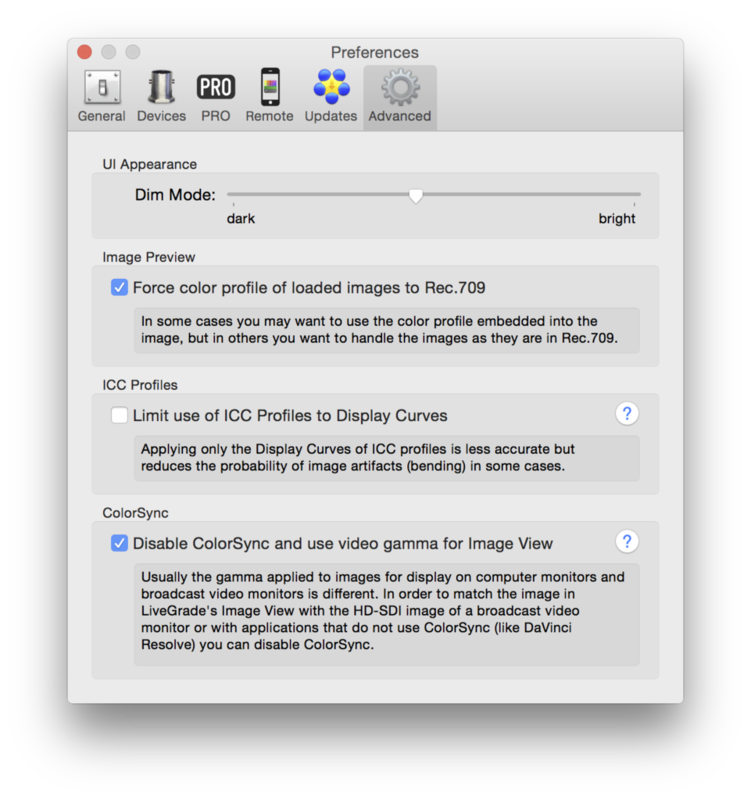 calibrate your monitor by creating a custom ICC profile – using a video gamma of your choice (e.g. 2.4 or 2.45) as the destination gamma of the profile in the calibration process. Performing these steps should lead to the exact same image of LiveGrade’s Image View on the attached monitor – when compared to a non color-managed system or the camera signal displayed directly (e.g. via HD-SDI) on a broadcast reference monitor. Open LiveGrade’s preferences, go to the “Advanced” tab (see Figure 1). Check the checkbox “Disable ColorSync and use video gamma for Image View”. Note: It’s possible to output the Image Viewer through the SDI Out when using LiveGrade Pro as described in the article Image View Output to HD-SDI in LiveGrade Pro.